Competitive Market Share & Forecast « Global Market Insights, Inc.
Waterproof breathable textiles (WBT) market size is anticipated to grow at a rate of 5.4% over 2015-2022, owing to its rising applications in sportswear coupled with growing consumer awareness about environment-friendly products. Rising demand for recycled polyethylene terephthalate (PET) bottles in fabric production is anticipated to propel global WBT industry trends over the coming years. Growing popularity of waterproof breathable textiles across defense and medical sectors is projected to create lucrative avenues for the industry growth in the near future. Advancement in fiber technologies, which help in production of stain-resistant, antimicrobial, water-resistant, and moisture-resistant textiles is expected to boost waterproof breathable textiles industry size over the next few years.Europe waterproof breathable textiles market price worth USD 450 million in 2014, is projected to grow at a CAGR of 4.7% over the timeframe. The growth can be credited to rising awareness about health & fitness among the population. In addition to this, increase in number of sports activities such as hiking, is expected to contribute noticeably towards the regional growth. North America WBT industry size is anticipated to reach USD 600 million by 2022, owing to high demand for waterproof and breathable apparels. Furthermore, changing consumer lifestyles accompanied by growing fashion trends is further predicted to boost the growth. Asia Pacific waterproof breathable textiles industry revenue is projected to grow at a CAGR of 6.5% over the coming six years. Active sportswear segment is expected to contribute substantially towards global waterproof breathable textiles market share over the next few years. WBT industry size in the active sportswear segment worth USD 1200 million in 2014, is expected to register a CAGR of 5.3% over the timeframe. The high growth can be attributed to its breathable property, ensuring ventilation to skin during perspiration. It also finds applications in other sectors such as water sports, mountaineering, rock climbing, snow sports, and outdoor lifestyles. WBT market revenue in other sectors is expected to reach USD 300 million by 2022. Major waterproof breathable textile products include garments, footwear, and gloves products. Garments market worth USD 875 million in 2014, is forecast to record a CAGR of 5.1% over 2015-2022. The growth can be attributed to its increasing application in mountain sports and trekking activities. Footwear market size is expected to grow at a rate of 6% over the coming six years. The growth can be attributed to its lightweight, insulating, and high-strength properties. Based on the types, waterproof breathable textiles (WBT) market is segmented into membrane, coated, and densely woven waterproof breathable textiles. Membrane waterproof breathable textiles (WBT) industry, which contributed nearly 71% of the overall demand, is expected to record highest gains of 5.5% over 2015-2022. The growth can be attributed to its high water resisting property along with its ability to help in water evaporation. 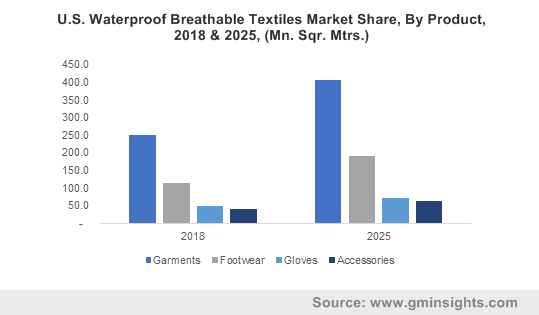 Densely woven waterproof breathable textiles (WBT) market is expected to record a CAGR of 5% over the coming six years, driven by its rampant use in medical, defense, and work wear sectors. Market players will try to increase their product portfolio by adopting key business strategies such as mergers & acquisitions and product differentiation. Key industry players include W L Gore & Associates, SympaTex, and Polartec. This entry was posted in Polymers and Advanced Materials and tagged Application Potential, By Application, Competitive Market Share & Forecast, Industry Outlook Report, Price Trends, Regional Analysis, Waterproof Breathable Textiles (WBT) Market Size By Textile. Rise in vehicle sales and construction activities across the globe is predicted to drive thermoplastic polyolefins market size over the coming years. According to Global Market Insights, Inc., “Thermoplastic Polyolefins Industry size is anticipated to reach USD 4 billion by 2023.” Moreover, it finds wide applications in medical industry owing to favorable features such as excellent thermal stability, design versatility, crystal clarity, mutagenic potential, and high resistance. Strict government norms for reducing greenhouse emissions to minimize environmental pollution is predicted to boost the demand for thermoplastic polyolefins over the next few years.Growing preference for thermoplastic polyolefins over polyvinyl chloride owing to environmental risks caused by PVC usage, will further boost the industry growth over the coming years. Strict CAFÉ (Corporate Average Fuel Economy) regulations have emphasized vehicle manufacturers to innovate ways for reducing vehicle weight to ensure minimal pollutant emissions in the atmosphere. This is expected to stimulate TPO demand in automobile applications over the next few years. 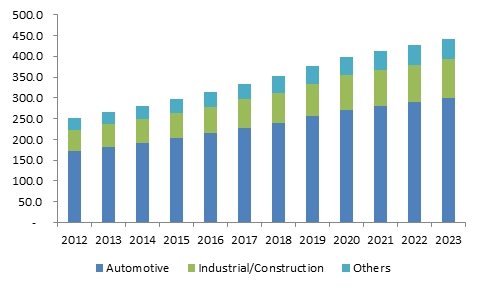 TPO market share in automotive industry accounted for over USD 1.6 billion in 2015, and is estimated to witness a significant growth over the coming years. The growth can be attributed to processing ease, design flexibility, ability to be recycled, and lightweight properties, which in turn helps in reducing fuel emissions from vehicles. Construction sector is another lucrative industry favoring TPO demand significantly. TPO market size in construction industry is predicted to grow at a rate of 6.8% over the period of 2016-2023. The growth can be credited to its extensive application in manufacturing roof tops for both commercial and residential infrastructure owing to its solar radiation inhibiting characteristic. North America market price worth USD 860 million in 2015, is anticipated to witness substantial gains over the coming years. Its growing applications in construction, automotive, medical, and packaging sectors is projected to drive the regional demand over the coming years. Moreover, strict automotive fuel efficiency norms are predicted to boost the product popularity in the region. U.S. is expected to make significant contribution towards the overall regional revenue. Europe market share is anticipated to exceed USD 1 billion by 2023, owing to the increased application of these products in medical and packaging sectors as compared to other traditional polymers and elastomers. UK, Germany, France, and Italy are expected to be the major revenue pockets for the region over the next few years. Asia Pacific TPO market is expected to exceed USD 1.3 billion by 2023, owing to heavy construction spending along with booming automotive sector. Japan, India, and China are expected to contribute significantly towards the regional share in the near future. Market players will try to enhance their product portfolio as well as revenue through mergers & acquisitions, joint ventures, and strategic alliances. Key industry participants include DuPont, INOES, A. Schulman, Mitsui, Arkema S.A, Noble polymers, The DOW Chemical Company, ExxonMobil, Polisystem UK Limited, SABIC, Sumitomo Chemical, S&E Specialty polymers, GAF, LyondellBasell Industries, and Spartech. This entry was posted in Polymers and Advanced Materials and tagged Application Potential, Competitive Market Share & Forecast, Industry Analysis Report, Price Trends, Regional Outlook, Thermoplastic Polyolefins (TPO) Market Size By Application. Extensive use of coated fabrics in manufacturing air bags as well as seat covers in automotive sector along with strict government norms addressing the safety concerns of factory workers is expected to drive global coated fabrics market growth. According to Global Market Insights, Inc., “Coated fabrics market share worth USD 18 billion in 2015, is predicted to reach USD 27.4 billion by 2024, registering a CAGR of 4% over 2016-2024.” Growing demand for coated fabrics from OEMs to manufacture motor vehicle upholstery, convertible tops, spare tire covers, headliners, and heavy-truck covers is predicted to boost the industry growth over the next few years. Growing vehicle sales in Thailand, Indonesia, China, and India are expected to enhance the popularity of coated fabrics in automotive sector. Consistent efforts to improve the aesthetic appearance of seat cover designs are expected to boost the product demand over coming years. Global industrial protective clothing expenditure worth USD 5 billion in 2015, is anticipated to grow at a rate of 14% over the period of 2016-2024, owing to favorable government policies ensuring employee safety in industries. Food processing, medical, agriculture, defense, law enforcement, and chemical processing industries provide protective clothing to their workers to protect them from heat, biological pollutants, chemicals, and ecological hazards. Coated fabrics find myriad applications in protective clothing, furniture, and transport sectors. 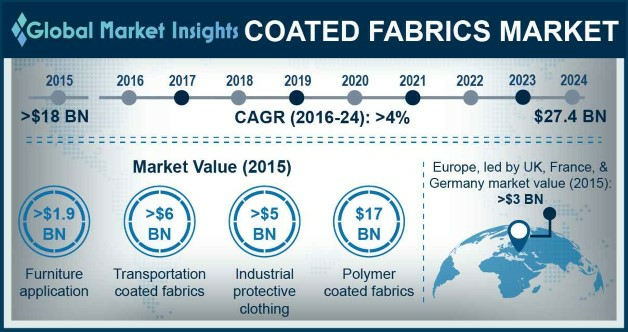 Coated fabrics market size in transport industry worth USD 6 billion in 2015, is expected to witness a high growth over the period of 2016-2024 owing to its increasing use in marines, automobiles, and aviation sectors. Its application in protective clothing sector is expected to grow at a rate of 4% over 2016-2024. The growth can be attributed to standardized factory regulations ensuring worker safety by mandating the use of protective clothing for workers to protect them from accidents occurring during the working hours. Coated fabrics application in furniture industry worth USD 1.9 billion in 2015, is projected to witness a high surge over the period of 2016-2024. Major coated fabric products comprise fabric backed wall coverings, polymer coated fabrics, and rubber coated fabrics. Polymer coated fabrics market price worth USD 17 billion in 2015, is expected to witness significant growth over the coming eight years owing to high demand for air bags and protective clothing in manufacturing industries. Rubber coated fabrics industry size is forecast to exceed USD 2 billion by 2024, driven by its favorable properties such as elasticity, durability, and resistance to degradation. High product demand can also be attributed to its growing application in food conveyor belts, gymnasium mats, storage bags, aprons, lifeboats, truck covers, and protective garments. Fabric wall backed covering market is projected to witness a noticeable growth over the coming years due to heavy spending on public infrastructure and growing consumer inclination towards home interiors. Europe coated fabrics industry size worth USD 3 billion in 2015, is expected to witness a considerable growth over the period of 2016-2024. Strict government compliances related to worker safety coupled with standardized norms associated with passenger safety are expected to drive the regional growth. Germany, UK, and France are the major regional revenue contributors. Asia Pacific market is predicted to record a CAGR of 4% over 2016-2024, owing to its growing demand in transport industry and protective clothing applications. Furthermore, the growth can also be credited to the presence of many manufacturing firms in the region. Malaysia, China, India, and South Korea are predicted to contribute substantially towards the regional growth over the coming years. North America market is forecast to witness a noticeable growth over the coming eight years, due to growing product demand in the automotive industry along with large-scale use of protective clothing in oil & chemical industries. U.S. is expected to be a major contributor towards the regional share. Latin America coated fabrics industry is projected to witness highest gains over 2016-2024 owing to high growth of motor vehicle industry. Brazil and Argentina are predicted to make substantial revenue contributions in the near future. Middle East & Africa (MEA) market is expected to grow considerably over the period of 2016-2024 due to the presence of large construction projects along with strict rules regarding worker safety in factories. UAE, Saudi Arabia, and Kuwait are expected to drive the regional growth. Market players will try to increase their revenue through product & technology innovation and mergers & acquisitions. Key industry participants include Takata Corporation, Omnova Solutions Incorporation, Trelleborg AB, Saint-Gobain, and Canadian General Tower Limited. This entry was posted in Polymers and Advanced Materials and tagged By Application, Coated Fabrics Market Size By Product, Competitive Market Share & Forecast, Growth Potential, Industry Analysis Report, Price Trend, Regional Outlook. Growing demand for polyamide resins owing to rise in expenditure on construction activities is predicted to favorably affect global dimer acid market size over the coming years. According to Global Market Insights, Inc., “Dimer Acid industry size is predicted to reach USD 2.2 billion by 2023.” EPA and REACH norms favoring the use of dimer acid in various sectors owing to its non-toxic nature is expected to boost the global industry trends over the coming years. Rapid urbanization as well as high economic growth along with heavy spending on infrastructure in countries such as South Africa, China, Mexico, Brazil, Russia, and India are projected to contribute significantly towards the industry growth over the coming years. Furthermore, the use of dimer acid in surfactants, alkyd resins, fuel oil additives, adhesives, and lubricants is anticipated to increase the industry share over the next few years.Dimer acid are extensively used in end-use segments such as oilfield chemicals, which find wide applications in refining, well drilling, and hydraulic fracturing. They are also used in feedstock comprising lubricants, corrosion & scale inhibitors, surfactants, wetting agents, and demulsifiers. Rising amount of drilling activities carried out across the globe for fulfilling global energy requirements is predicted to propel the demand for oilfield chemicals, thereby contributing to global dimer acid market growth over the coming years. Dimer acid market size in oilfield chemicals segment is predicted to reach USD 360 million by 2023 owing to their extensive use in shale gas exploration and extraction activities. Dimer acid also finds its application in reactive polyamide resins and non-reactive polyamide resins. Dimer acid market share in non-reactive polyamide resin segment accounted for over USD 560 million in 2015, and is anticipated to grow considerably over the coming years. The growth can be contributed to high demand for solvents from printing inks, paper coatings, and adhesives. Its application in reactive polyamide resin segment is expected to grow at a rate of 4.6% over 2016-2023, owing to the rising demand for adhesives & coatings in construction and marine sectors. North America dimer acid market price worth USD 300 million in 2015, is projected to witness a substantial growth over the coming seven years. The regional growth can be credited to rapid infrastructure development along with supportive government policies favoring the use of epoxy, masonry coatings, and adhesives in the construction sector. U.S. market revenue worth USD 200 million in 2015, is expected to register highest growth rates at 6% over 2016-2023. 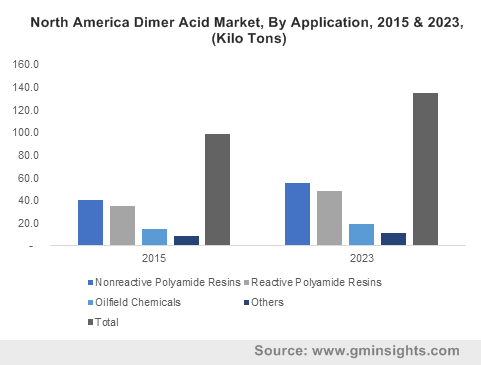 Asia Pacific dimer acid market size is expected to surpass USD 850 million by 2023 owing to growing urbanization, industrialization, and high demand for polyamide resins. India and China are predicted to be the major revenue generators for APAC industry. Europe dimer acid market is expected to record a CAGR of 6% over the period of 2016-2023. The growth can be attributed to rapidly expanding end use industries across this region. For instance, quantitative easing strategy adopted by European Central Bank for financing private sectors is likely to boost the growth of end-use sectors such as transport, plastics, construction, and energy. UK and Germany are projected to contribute substantially towards the regional share. Market players will try to increase their regional presence through mergers & acquisitions and joint ventures. Key industry players include Arizona Chemicals, BASF, Croda International Company, Oleon, Anqing Hongyu Chemical Company Limited, Nissan Chemical Industries Limited, Shangdong Huijin Chemical Company Limited, Aturex Group, Liancheng Baixin Science & Technology Limited, Jiangsu Yonglin Oleochemical Company Limited, Florachem Corporation, and Novepha Company Limited. This entry was posted in Bulk & Specialty Chemicals and tagged Application Potential, Competitive Market Share & Forecast, Dimer Acid Market Size By Application, Industry Analysis Report, Price Trends, Regional Outlook. Paints & coating industry, which is forecast to exceed USD 210 billion by 2024, is estimated to be the most lucrative sector for this billion-dollar market over the coming period. Paints and coatings industry accounted for nearly 30% of the global rheology modifiers share in 2015. These modifiers are witnessing a huge demand across this industry, owing to their ability to improve the durability, consistency, emulsion stability, leveling, and anti-sagging properties of the paints. 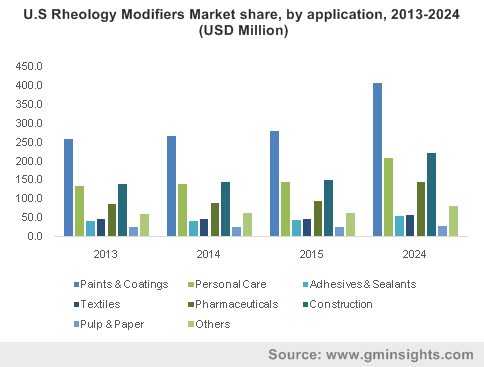 The increasing urbanization coupled with the growing automotive and construction industry is favorably impacting the paints & coatings market, which in turn will drive the rheology modifiers market size. Personal care industry, which is yet another booming industry, is also a vital driving factor for rheology modifiers market. personal care industry, having had a market value of USD 580 billion in 2015, is estimated to surpass USD 790 billion by 2024. This growth will in turn boost rheology modifiers market owing to its rising demand across various personal care products to impart desirable properties such as suspension, consistency, and stabilization to these products. Inorganic modifiers are mainly used for the personal care industry. Rheology modifiers application in the personal care industry is estimated to grow at a CAGR of 3.5% over the period of 2016-2024. The growing geriatric population and the rising health awareness among the consumers is boosting the pharmaceutical market globally. These modifiers are in turn witnessing a huge growth owing to their applications in the pharmaceutical industry as additives in semi-solid formulations like ointments, lotions, syrups, etc. Organic modifiers such as polyurethane, acrylic polymers, xanthan gum, microcrystalline cellulose, and guar gum are used in pharmaceutical applications. Organic rheology modifiers market size is estimated to witness a CAGR of 3.5% over 2016-2024. The paper industry is also a significant contributor towards this market. However, the growth in this sector is sluggish due to the growing digital trends which has reduced the growth of paper industry. Moreover, the fluctuating crude oil prices may also negatively impact rheology modifiers industry growth, crude oil being the essential raw material for these compounds. The growth in the end user industries across the globe will fuel rheology modifiers market size. US, being the largest hub of the geriatric population, is estimated to account for a significant share in the rheology modifiers market. Moreover, the growth of the pharmaceutical and personal care industries in US will also drive the regional revenue. Asia Pacific market, which accounted for 35% of the global revenue in 2015, is estimated to register a CAGR of over 4% over 2016-2024. Rapid industrialization coupled with the expansion of automotive and construction industry are the major driving forces behind APAC rheology modifiers market growth. This entry was posted in Bulk & Specialty Chemicals and tagged Competitive Market Share & Forecast, Growth Potential, Industry Analysis Report, Price Trends, Regional Outlook, Rheology Modifiers Market Size By Product. Sterilization processes are mostly used to sterilize and disinfect surgical equipment owing to its direct patient contact during surgery. The growing use of these processes to prevent hospital- acquired infections will promote the growth for chemical indicator inks over the coming years. 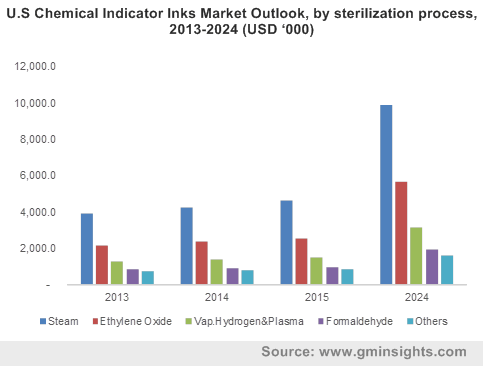 As per Global Market Insights Inc., “Chemical Indicator Inks Market size worth USD 35 million in 2015, is anticipated to reach USD 78.30 million mark by 2024, growing at a CAGR of 7% over the period of 2016-2024.” In addition to this, advanced sterilization processes such as vaporized hydrogen & plasma, steam, ethylene oxide, and formaldehyde are predicted to further stimulate the industry growth over the coming years. The global surgical instrument industry produced a revenue over USD 5.5 billion in 2015 and is expected to boost chemical indicator inks industry growth significantly. Sterilization processes have a great significance in surgical equipment industry and is classified into steam, formaldehyde, vaporized hydrogen & plasma, and ethylene oxide process. Steam sterilization process produced revenue of USD 15 million in 2015 and is mostly preferred in medical sterilization application as it is nontoxic, sporicidal, microbicidal, heats quickly, and penetrates fabrics. Ethylene oxide sterilization process is anticipated to record a CAGR of 8% over the period of 2016-2024 owing to its use in pharmaceutical & medical products sterilization as well as its use in low temperature applications. Formaldehyde sterilization process is projected to record a CAGR of 7% over the forecast timeframe, owing to its use as a disinfectant for deactivating microorganisms through alkylation. Global chemical indicator inks market is primarily driven by its applications in thermoformed trays, sterile bags, tapes, sterile bottles, IV & blood containers, pouches, refillable syringes, and tags & labels. They are also used in canned foods like fish & meat to provide information about the sterilization process completion and thus avoid excessive overheating of foods resulting in retention of food nutrients. Chemical indicator inks demand in Sterile bags applications was over USD 3.5 million in 2015 and is predicted to increase over the forecast period. Water-based chemical indicator inks market is predicted to witness highest gains at 8% over the forecast period owing to strict government norms favoring solvents such as water due to their ecofriendly features. North America chemical indicator inks market worth USD 13 million in 2015, is predicted to witness a significant growth over the forecast timeline due to growing geriatric population leading to heavy product demand for sterilization monitoring in the healthcare industry. U.S. market worth size worth USD 13 million in 2015, is predicted to contribute significantly towards the regional growth over the forecast timeline. Europe chemical indicator inks market is predicted to record a CAGR of 8% over the period of 2016-2024 due to rising ecological concerns due to VOC emissions. Key industry players include 3M, Terragene SA, NiGK Corporation, STERIS, North American Science Association (NAMSA), Riken Chemical, Crosstex International Incorporation, and gke GmbH. 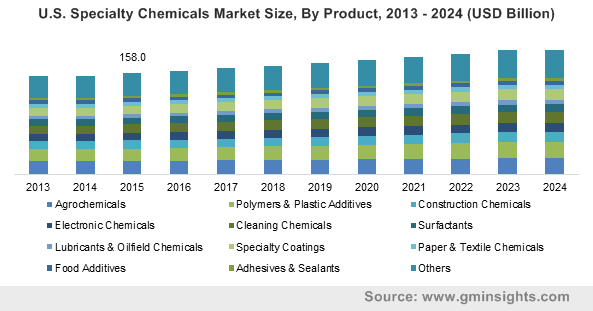 This entry was posted in Bulk & Specialty Chemicals and tagged By Application, By Printing Process, By Product, Chemical Indicator Inks Market Size By Sterilization Process, Competitive Market Share & Forecast, Growth Potential, Price Trends.